Review of Hoppin’ Frog Fresh Frog Raw Hop | Beer Apprentice - Craft Beer News, Reviews, Interviews and Info. Hello again guys. For today’s craft beer review I’m going to be sipping on a Fresh Frog Raw Hop brewed by the Hoppin’ Frog Brewery located in Akron, Ohio. I’ve been a bit perplexed when it comes to Hoppin’ Frog brews. Up to this point I haven’t tried one that I’ve found to be exceedingly pleasing. Here’s hoping that this beer changes all of that. 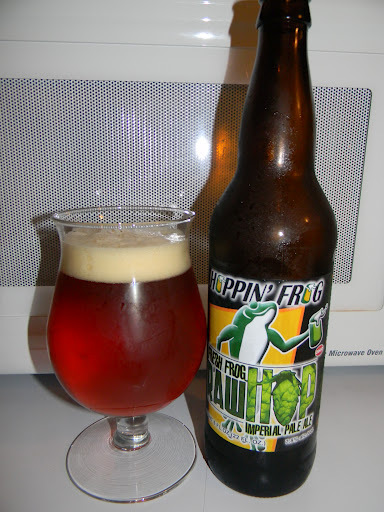 I couldn’t find any information regarding this particular beverage on their website, hoppinfrog.com, so I’m going to check on ratebeer.com and see what I can find out. Special hoppy flavors and aromas are captured by adding freshly picked, undried hops during the harvest. These wet hops impart a character unlike other brews, that is quite unique and satisfying for those who love hops – the spice of beer. Smell the hop fields, smell the freshness. I realize that this beer is a few months old, but I’m going to give it a whirl anyway. This beer comes in a 22 oz. bomber and it has an ABV of 7.8%. It poured a semi-clear, deep orange to copper color with an off white head that was of decent size. It was smooth, creamy and soft. The retention time was quite suitable and the lacing seemed adequate. It looked pretty good I thought. The nose brought out a nice burst of hops. Orange and grapefruit citrus were the notable players, however I also found some piny and resiny components. A very light bit of caramel malt was stumbled upon as well. Some floral aspects encompassed the entire bouquet to create a very, very solid aroma. It wasn’t too robust or brazen nor did I find any of the mentioned spices. All in all, just a nice smelling beer in my humble opinion. The taste had more of that juicy goodness. Citrus of grapefruit, orange and maybe even a little bit of peach. The caramel sweetness did begin to be more noticeable in the taste than it did in the aroma. I guess that has to do with the bit of age and the hops breaking down a touch. Either way, it was quite fitting and complimented the hops nicely. This brew is not at all a “hop bomb” like other IPA’s can be, although enough bitterness and hops were present to elicit a nice showing. Some more of those piny facets completed the flavor profile and helped to create a well balanced and flavorful beer. Again, I didn’t really find an trace of the spices. Hmm. Who knows? The mouthfeel was medium bodied. It was dry, smooth, lightly chewy and just a touch sticky. It was rather refreshing I thought. The carbonation was good and little to no warmth was felt from the alcohol. An adequate amount of flavor was left behind on the palate after each sip also. I tell ya. Even though I wasn’t able to obtain this brew at its freshest, I thought it was still mighty tasty. It’s one that I will definitely keep an eye out for when it is next released. It was very easy to drink and it still displayed enough of those fresh hops to make me want to continue to drink it. If I liked it this much the way it was, I can only imagine what it would be like when extremely fresh. So, be on the lookout for the Hoppin’ Frog Fresh Frog Raw Hop later this year. Be sure to let me know what you think of it when you try it also. I doubt that you will be disappointed.